There is always a danger when you are waiting anxiously for a book that it won't live up to your expectations. Sonali Dev set the bar incredibly high with her previous books and there is always that worry that the next one will be a weak link in the chain. Fortunately, Dev is better than that and this book is an excellent conclusion to her Bollywood series. First things first, this is not a standalone novel. It really is necessary to read the previous book, A Change of Heart, before starting this one as the plot actually begins in that book (and it you really should read The Bollywood Bride before A Change of Heart. It isn't necessary to read the first book in the series, A Bollywood Affair, before reading the others--but you really should because it is awesome!). I will say that I had a minor issue, completely of my own making, between these two books. Rahul is introduced in A Change of Heart, and I pictured him completely differently than he's presented here. This is not Dev's fault--nothing in her previous book contradicts how his character develops here. Instead, it was what I put on him in the previous book. The fact that I recently did an audio re-read of A Change of Heart and the narrator used a much older sounding voice for him didn't help. Again, this wasn't a problem with the book, but something I had to adjust to. Once I got used to him, I really enjoyed Rahul. I found him to be much deeper than we usually see with romance heros. I have to admit that I fell a little bit in love with him--not that I want Kimi out of the way, mind you! Kimi, oh Kimi! I need to start this by saying that I adored her--but I'm not sure I can describe her in a way that doesn't make her sound a little annoying. She reminded me a bit of one of those overly cheerful people that seem oblvious to others troubles (but in a good way!) She is more than a bit self-centered (but in a good way!) and she definitely is a bit spoiled (but in a good way!) I told you--it isn't going to sound like she'd be likable, but she really is! She is the sort of person who just want to have around you, who would do anything for those she cares about. While there is a dark central plot here (can you get darker than black market organ theft? ), this is one of the lighter books in the series. It is a retelling of Rapunzel and I loved how Dev allowed Kimi and Rahul's relationship to grow. Things start as a friendship--and a real friendship So often, we get "friendships" which are really just precursors to someone wanting to get into someone else's pants. Kimi and Rahul's, however, seems much more organic. This is the only book in the Bollywood series to be set completely in India (well, nearly--there is one short foray to Hong Kong). The description is so detailed that you feel like you are there. I could almost smell the spices that permeate the air. Most striking is how well Dev illustrates the differences between the haves and have-nots in this society. So, while this is a retelling of Rapunzel, it also has strong Dirty Dancing overtones, and there is nothing bad about Dirty Dancing overtones! "Contrary to what people believed about her, she didn't believe that she was the center of her universe. She was in fact someone whose entire existence focused on wanting a universe she could be part of." See! I told you that Kimi was fabulous, despite everything I also said about her! I can't recommend this book enough--actually, I can't recommend this entire series enough. 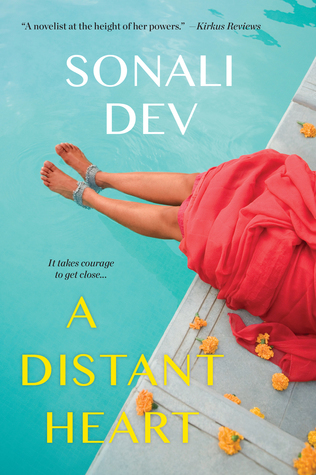 Sonali Dev is the author who got me back into reading romance, and I will be forever grateful to her for that.